Do you know why it’s impossible to lick the tips of your elbows? They hold the secret to immortality, so if you could lick them there’s a chance you’d be able to live forever. As long as I’ve known my husband and co-reviewer, I’ve heard nearly non-stop about multiverses and parallel universes and alternate dimensions and quantum mechanics and relativity and black holes and string theory…the list goes on ad infinitum, and not surprisingly, much like the tenets of the aforementioned theories themselves. He’s also been known to toss out the notion of how time doesn’t really exist…that past, present, and future are all the same. Huh, I say. Further, he’s been known to tell me – especially during random difficult periods – that the better stuff is already happening. Like, at that moment. To him, in a parallel universe, things are all wine and roses. 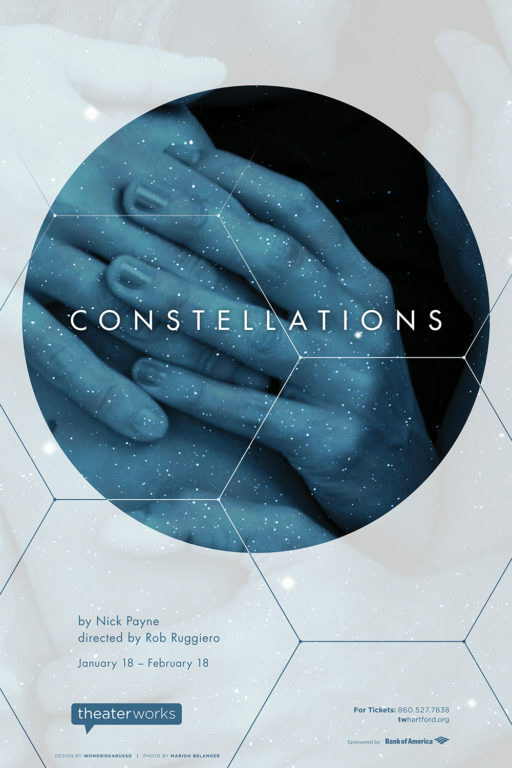 When he heard the buzz about Nick Payne’s play Constellations and its Broadway run in 2015, he was all over it; however, the two-month limited engagement didn’t give us enough time to work it into our schedule. But then when we heard that TheaterWorks Hartford was planning a production of it, both he and I couldn’t have been more thrilled. If anyone could do it right, Rob Ruggiero, TheaterWorks’ Producing Artistic Director (and director of the production) could. And considering that his production of another Broadway gem we’d missed – the rock opera Next to Normal – blew it out of the park, we knew he’d be setting the gold standard for us for a work to which no one who’ll follow could possibly measure up. Were we disappointed? Absolutely not. 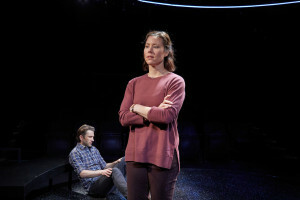 Constellations is an expertly delivered, riveting, and thought-provoking piece of theatre. It essentially incorporated all of Wayne’s cosmological interests and dinner table conversations in a way a general audience could understand, tossing in with it a healthy dose of romance and love; anguish and loss; and the issues of free will and destiny. 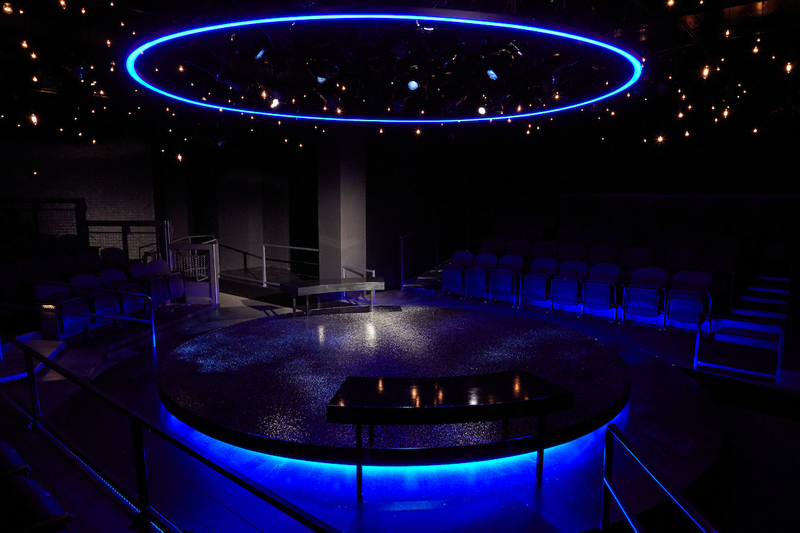 To get the audience in the mood, TheaterWorks was completely transformed – starry lights hung throughout and its usual cozy three-sided seating became a theatre-in-the-round, allowing for total immersion into the intimate world (or worlds) of the characters, Marianne and Roland. For these two, a peculiar and humorous chance meeting (see the quote above) between a Cambridge University astrophysicist and an affable beekeeper (who may or may not have been single at the time) takes place at a barbeque (to which Marianne may or may not have been invited). The encounter leads to the limitless possibilities of a relationship that may or may not develop from that point (or points) forward. A phenomenal Allison Pistorius as Marianne injects just the right balance of academic nerdiness and quirky charm, wholeheartedly and with sincerity. Roland, played by M. Scott McLean who blew us away in TheaterWorks’ Midsummer (a play with songs), may be the more understated of the pair but no less spectacular. McLean is natural, engaging, and altogether loveable. The chemistry between the characters seems effortless, albeit often fraught with conflict, heartache, and heartbreak. Nick Payne tackles the complicated principles of the cosmos with ease and delightful repartee. The graceful back-and-forth, forward-and-back, sideways, slantways and upside-down choices and outcomes could leave one’s head spinning, but instead merely allow us to pause and consider how even the smallest decisions can have the greatest impact in our lives. Who hasn’t considered after hearing of a fatal accident on the highway how if only they’d left at the time they’d intended to leave, that it could have been them? Or if they hadn’t attended the party the night they felt a cold coming on, they’d never have met their soulmate? Ultimately the outcome for the characters in life and in love is left up to the audience to decide. Payne doesn’t play God – he instead provides us with food for thought, fuel for discussion, and a reason to pick up Stephen Hawking’s A Brief History of Time so we can feel smarter the next time someone brings up quantum theory. Kudos to Ruggiero for a spectacularly executed piece of performance art and to Pistorius and McLean for bringing it to life. To Composer/Musician Billy Bivona for his incredible live (and evidently ever-changing) accompaniment, breathing additional life to the work. To Jean Kim for a simple yet powerful set design; Philip S. Rosenberg for impeccable lighting design; Michael Miceli for seamless sound design. Shout-outs also to McCorkle Casting; Taneisha Duggan as Assistant Director; Bridget Sullivan as Production Manager; Kate J. Cudworth as Stage Manager; and Laurel Whitsett as Sign Language Coach. Constellations will force you consider the importance of every decision and their ripple effects throughout your life. Attending TheaterWorks’ dynamic and engaging production, however, should be the easiest decision you’ll make. In between my childhood rearing as a “loose” Catholic, a Jesuit education, and my dalliances with existentialism, Buddhism, and mindful meditation, I became hooked on quantum physics. In fact, for many years when people would ask me my religion, I would tell them it was quantum physics. Why? Well, you do not need to be a physicist to enjoy Constellations, but a little bit of scientific knowledge (which is given in exposition) is helpful. For example, on the macro level – what we see and do on a daily basis – Newtonian physics are alive and well: the planets revolve around the sun, the things we see and perceive are solid and real, and time is linear. But on the micro or molecular level, discoveries and theories have been made in quantum mechanics and quantum physics that not only fall with the realm of science fiction, but are utterly unfathomable. For example, at the quantum level, nothing is solid, everything vibrates, and time as we know it is not linear. A particle can be in many places at the same time which leads to the larger corollary there are parallel universes, and every time we come to a decision, the universe divides and any number of alternative choices are made in parallel worlds. For all intents and purposes, our whole view of objective reality is entirely undermined. So right now, in one universe you are reading my review and thinking I am the next Pulitzer Prize-winning writer; and in another universe the identical you is reading this review thinking I’m the worst hack on the planet. The use of parallel universes as conceits or plot devices is hardly new or unique to the fiction world. The possibility of a parallel universe was explored way back in the 70s gothic soap opera Dark Shadows. More recent television treatments include Fringe and Sliders. Significant films using the device include Sliding Doors, Donnie Darko, and The Butterfly Effect. Countless authors from H.G. Welles back in the 20s to Blake Crouch’s recent and excellent novel Dark Matter. For some reason, however, the idea of parallel universes has eluded the theatrical milieu until very recently. Perhaps it’s the ways stage plays are more rigidly structured than film, television, anime and videogames. There is the musical If/Then which explores alternate realities and is currently touring nationally. 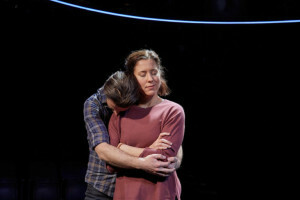 There also is the drama Constellations by Nick Payne which had a limited run on Broadway and starred Jake Gyllenhaal. I was so distraught when our schedules prevented us from seeing it, that I actually hunted down the book at The Drama Bookshop and read it – one redundant page after another. I so wanted to love it. Instead, as a simple read, I thought it was flat, boring and uninteresting. I even told my wife and co-reviewer not to bother to read it. I just could not understand how this one-punch idea could be performed – much less successfully performed. It’s simply about two people meeting and repeating the same lines over and over again with different outcomes. And then I saw Constellations at TheaterWorks Hartford and the epiphany that I had when I first started as a theatre culture vulture came back to me in all its shining glory: plays must be seen and experienced to be fully appreciated and not just read. Rob Ruggiero’s brilliantly directed Constellations is an electrifying, thought provoking, and completely engaging play. Allison Pistorius (Marianne) and M. Scott McLean (who Pillow Talking loved in Midsummer) were wonderful as the star-crossed lovers (or maybe not star-crossed lovers in every universe). They both gave highly nuanced and layered performances. Most impressive was their ability to go from the brink of despair one moment to a gloriously ecstatic state the next and then to repeat the nadir-to-zenith lightening quick character arcs throughout the play. There also was a great deal of humor which the flesh-and-blood actors engendered which I did not glean from a mere reading of the play. The minimalist but effective set design by Jean Kim and halo-shaped set light surrounded by string lighting by Philip S. Rosenberg added to the ethereal ambience of the play. 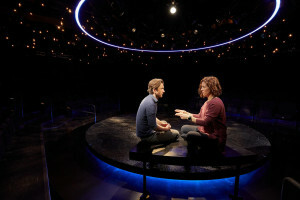 Constellations is the type of play that keeps you up at night pondering life’s imponderables. In many ways, it represents the best evidence of free will. As the character of Marianne explains in the play, if there was only one universe and the laws of physics were so clearly defined and unalterable, then everything would be left to fate. But, if there are multi-universes and any number of choices can be made in these universes, then our destiny lies within the decisions and choices we make and, consequently, life is not pre-determined. The play also makes the case that while things like health, diseases, and natural disasters may be inescapable in a multi-universe scenario, how we deal with them and the decisions we make (or don’t make) make all the difference in the world. All I know is, that if there parallel or multi-universes with identical doppelgangers of myself, then I am completely certain that I loved Rob Ruggiero’s take on Constellations in each and every one of those universes.